In 1985, the Internet Domain Name System was created. 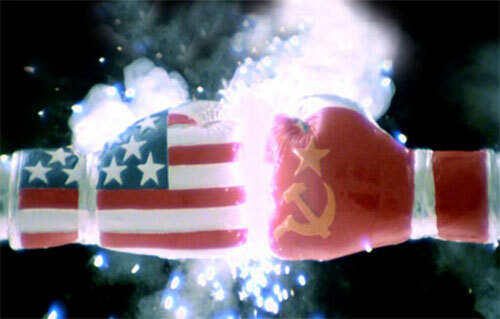 Ronald Reagan was sworn in for his 2nd term, Rocky IV debuted and Rocky Balboa began the first steps to ending the Cold War. If the original Rocky was the classic, Rocky II the inevitable sequel, and Rocky III Sylvester Stallone showing off how muscley he could become, then Rocky IV was all of those movies wrapped up in to one. Now I know what you’re saying, “Yeah Jimmy, we know Rocky IV was an awesome movie. 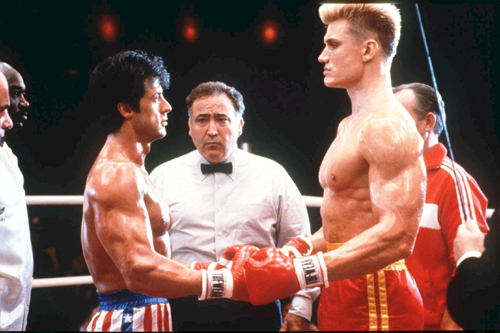 That’s why Frank in sales took conversational Russian before he boxes the only Italian guy in receiving, but what does Rocky IV have to do with parenting?” I’m glad you asked. Much of the trials and tribulations Rocky goes through in the movie (and his career) is not unlike a typical Tuesday for any parent. Spend 12 hours in a house with a toddler and I guarantee you, avoiding the KGB and running up the side of a snow covered Russian mountain will seem like a vacation. After double digit rounds of getting his head pounded on, Rocky had the same look I use to get when my girls wouldn’t take a nap. Still don’t believe me? One of the songs from the movie is called ‘There’s No Easy Way Out’. If that doesn’t sum up the first 3 years of your child’s life, then I don’t know what does? Rocky: But to beat me, he’s going to have to kill me. Heed special attention to this one if you’re a new parent. One thing you need to understand about your sweet little bundle of joy is that they are going to test you like no one has ever tested you before. Like going 12 rounds with a steroid filled Russian hell-bent on putting you in the grave. So you have to be willing and able to go the distance, which, when you open your kid’s diaper for the first time, we feel like you just died. But if that’s what it takes to outlast the tantrums, fits, sickness, misbehavior, and possible a left jab to your groin when you aren’t looking, so be it. Apollo: And without some challenge, without some damn war to fight then the warriors might as well be dead. Just when you think, ‘Thank God, my kids are old enough to make their own breakfast, get dressed, bathe, tie their shoes, and any other daily function of life that you spent the first few years of their lives doing’ is the moment you realize they don’t need you. Or at least they need you less. I’m going through this right now with my girls. I look around and there is no war to fight (Metaphorically of course. There are plenty of wars to fight with them especially as my oldest nears adolescence.). No shoes to tie. No food to cut. When it is what you know, you crave it. Parents need to parent just like warriors need to pummel each other repeatedly about the head. Drago: He’s not human. He’s like a piece of iron. This was a pivotal part in the movie. Ivan Drago, up until that point was seemingly indestructible. Then he stepped in to the ring with a man who was equally (if not more so) indestructible. One of the flaws kids have is their notion of invincibility. If, after everything they throw at you, you’re still standing there telling them to go to bed, there is a good chance they don’t say it exactly how Ivan did (and even less chance they do it in a Russian accent) but they’ll be thinking it. I did this 5 times a week during the 3rd trimester. To prepare. Nicoli Koloff: Whatever he hits, he destroys. A few seconds after you leave junior alone so you can run in to the kitchen to pull out the dinner that has burnt, the dog is shaved, the curtains are torn down, the TV is broken and your child, who can barely walk upright, is traversing the stairs. Whatever kids come in contact with, they are bound to destroy, just like a a crushing punch from Ivan Drago. Realize the destructive power of your children, cover up, and for godsakes, put that glass candy dish out of reach. Duke: You’re gonna have to go through hell, worse than any nightmare you’ve ever dreamed. But when its over, I know you’ll be the one standing. This speaks to not only the night before the biggest boxing match of your career but also the night before your last kid moves out of the house. I shouldn’t paint such a dark picture of parenting. Parenting is the most rewarding thing in my life but that is after middle of the night trips to the Emergency Room, stressing about their safety, their health, grades, acceptance by their peers, did you remember to close the gate at the bottom of the stairs, did you remember to take junior’s car seat off of the top of your Accord when you left the grocery store. You worry as a parent and it can be a nightmare. The worst nightmare you’ve ever dreamed. But in the end, if you’ve done everything you can then stand tall (and maybe get some sleep). Listen, don’t take it personally that your kid tests the boundaries set by you and your significant other. Tip toeing the line of rules is encoded in to each and every child’s DNA. Its what they do. They are going to try to break you because, like the steroid riddled Russian boxer who only knows he must destroy, this all they know. Eventually they’ll change (somewhere around their 30’s) but until then, they don’t want to break you, they ‘MUST’ break you. I must break you…and I don’t care about your curfew. Rocky: Going one more round when you don’t think you can, that’s what makes all the difference in your life. 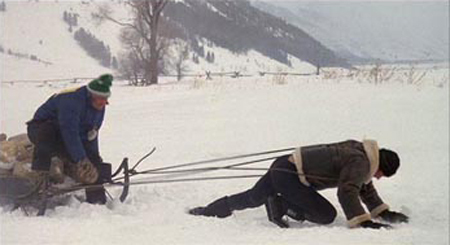 I don’t know if there is a better metaphor for parenting than this gem from the Italian Stallion. You’ll be exhausted. Stressed. You’ll most likely smell like a mix of strained peas and the diaper genie that hasn’t been emptied since your child’s baptism. You’ll hear your name called even when no one is in the house. You’re nerves will be raw. You won’t want to get up for that midnight feeding. You won’t want to try and clean the dried baby biscuit off of the high chair. You won’t be able to do one more problem from their math homework. And just when you think you can’t go on, you do. Why? You’re a parent. And when you get back up, not only does it make a difference in your life but it will make all the difference in theirs. This entry was posted in Uncategorized and tagged Italian Stallion, kids, Parenting, Rocky. Bookmark the permalink. I have the same relationship with West Side Story that you do with Rocky IV – parenting metaphors and all. They come in all shapes, sizes, and movies.